We all know kit manufacturers love nothing better than to recycle a design, swap the colours a bit and flog it to millions more fans. 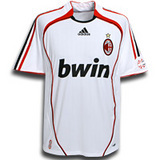 AC Milan’s away kit does bear a striking resemblance to the Germany national shirt and Real Madrid home shirt. The shirt will be on display at Old Trafford this evening when the Italian side take on Manchester United in the Champions League semi-final first leg (KO 7.45pm, ITV1). Click here to buy it from Kitbag for the very precise amount of Â£40.49.